In the past four years, the Federal Government of Somalia has been attacking the National Union of Somali Journalists (NUSOJ) and the Federation of Somali Trade Unions (FESTU), because these unions refused to be controlled by the government. 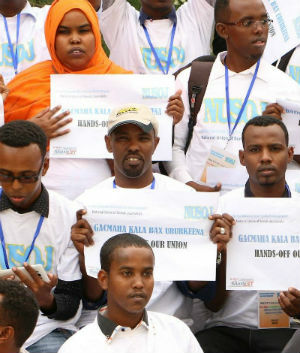 The government disbanded union meetings of NUSOJ in Mogadishu, imposed non-union members as leaders of FESTU and NUSOJ, intimidated union leaders and members including arrest, travel restrictions, de-registered unions to make them illegal, sacked most senior judges of the country who made favourable rulings for the union in February 2016, and denied FESTU the right to represent workers in tripartite platforms. The Supreme Court of Somalia and the ILO supported the demand that the government recognise the internationally recognised leadership of NUSOJ and FESTU, and stop the attacks on the unions.